Longtime Rehoboth Beach Country Club golf pro Ron Barrows is still very active in the state golf community, and especially with the Delaware State Golf Association. He recently sent out a note seeking high school student applications for the next round of the DSGA Scholarship Fund. The deadline for filing for these awards is May 1, so if you know of a deserving applicant, or are one yourself, don’t delay. The Fund awarded its first such scholarship in 1988. Over 100 students have been the lucky recipients of this significant financial support for college expenses. To date over $800,000 in scholarship grants have been made. The scholarships help support the grantees for 4 years. Applicants are expected to demonstrate community involvement, academic achievement, and a love for the game of golf. That last part should be the easiest. The Board overseeing the Fund also asks that the applicants note any interest in future career paths involving golf, whether it be in agronomy, course management, or work as a golf professional. However, Barrows also hastened to note that this interest is not a requirement for receiving a scholarship. Given the troubles plaguing the American golf industry in the last several years, that should be a relief. Scholarship applications can be found at the DSGA website, www.DSGA.org. Go to the Juniors section, and click on the Scholarships link. You can also contact Barrows at r.barrows-at-verizon.net. The scholarship winners are traditionally announced at the luncheon for the Rehoboth Beach Junior Open, typically held at RBCC the second week of June. The Delaware Solid Waste Authority is holding its Thirteenth Annual Golf Tournament May 8, at Baywood Greens in Long Neck. The tournament supports the John P. “Pat” Healy Scholarship program that offers a renewable $2,000 scholarship to Delaware students studying Environmental Engineering or Environmental Science at a Delaware college or university. Thus far the DSWA has awarded $54,000 in scholarship grants. Healy was a member of the DSWA board from 1994 until his untimely passing in 2003. The tournament begins with a brunch from 9 a.m. to 10:30 a.m., with a shotgun start at 11 a.m. Single players can participate for $180, with twosomes charged $350 and foursomes costing $600. The DSWA is seeking local sponsors for the event. Help can be supplied with door prizes, cash donations, and items for goody bags (160 pieces minimum). Gold, Silver, and Bronze sponsorships are also available, in increments of $2,500, $1,500, or $1,000 respectively. For more information, contact Jodie Sleva, Tournament Coordinator, at 302-739-5361, or email jhs-at-dswa.com. The Third Annual Irish Eyes Open is so much fun that it takes two days to enjoy all that it offers. This year’s event is held June 19-20, beginning with a reception and auction held at the Lewes Irish Eyes from 6:00 to 8:00 p.m. The reception includes an open bar and dinner, and both a live and silent auction. The golf starts with registration June 20 at the Peninsula Golf and Country Club, beginning at 10:30 a.m. The shotgun start begins at noon, and a box lunch is provided. A cocktail hour, BBQ, and awards ceremony is scheduled for 5:00 p.m. to 6:30 p.m. 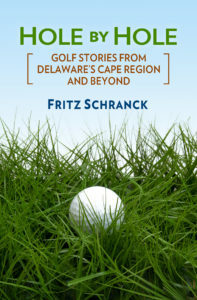 The tournament fundraiser helps support the Boys & Girls Clubs of Delaware, especially the Rehoboth Beach Club. Plenty of sponsorship opportunities remain. For more information, call 302-545-7645 or email jlogullo-at-bgclubs.com. The scheduled March 25 first day match of the Cape Henlopen High School golf team took a back seat to a rare spring snowstorm. The Vikings rescheduled their match against Smyrna High School to March 27, at Rehoboth Beach CC. If the weather holds, the team was scheduled to travel to Sussex Pines Country Club March 28 for their second match of the year, with Cape High’s spring break putting off the third match until April 8.